Steven Spielberg left his blue screen on the sound stage, Eric Bana left his Hulk suit in the closet, and Daniel Craig never blinked at the tuxedo he’ll need as the new James Bond. Instead, these three, along with an equally superb cast and crew created a work of art based on a terrifying premise. Using footage from one of the first terrorism attacks played out live on camera – the 1972 Olympic Games in Munich – Spielberg raises his directorial skills to a new level. With a crisp and cohesive script penned by Tony Kushner [Angels in America] and Eric Roth [The Insider] Munich challenges the 21st century viewer to think beyond the thirty second sound bites that permeate our media. We have become expert on being Johnny-on-the-spot when something horrible happens, shoving a microphone into a bystanders face moments after any kind of disaster, but what about the next day? And the day after that? Or, in this case, years later? 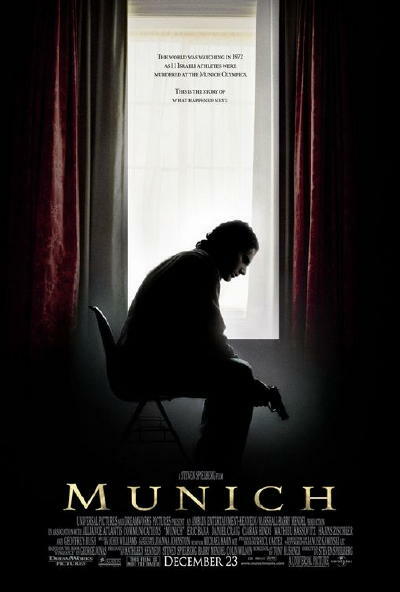 As a film, Munich never wavers from its mission, not unlike the gang of five men portrayed with directives for lethal retaliation. The gritty look of the film by cinematographer Janusz Kaminski is complimented by Michael Kahn’s taut editing. Even the usual predictability of a John Williams’ score goes out the window as the tension rises with each new scene. There are two key ingredients that make Munich great. Eric Bana is the first. In three hours, he portrays a lifetime of emotions. As Avner, he obeys commands, he acquiesces to sacrifice, he terrorizes, and, yet, he remains human and, therefore, believable. Bana is simply brilliant. Steven Spielberg. The man had success [Jaws], wealth [E.T. ], and artistic recognition [Schindler’s List]. He didn’t have to incur the wrath of those that challenge his political/artistic choices. Bravo to the director who in fact looked beyond the politics, the organized religions, the popular box office, and went straight for the cause of so much turmoil on this earth – man’s inhumanity to man. Along the way, he raised questions with Munich. Now it’s up to the discerning film viewers to question as well.